The West Hall (West Hallway in PAL version) is a room inside the Haunted Towers in Luigi's Mansion: Dark Moon. The West Hall can be accessed by taking the door on the right inside of the West Bedroom or by taking the door on the left in the Crow's Nest. The West Hall is a small room with little significance. There are crawling spiders and different foliage growing. The door on the left leads back to the West Bedroom and the door on the right leads back to the Crow's Nest. The door to the north leads to the West Bathroom. In B-4: Pool Party, Luigi needs to go to the West Hall to reach the West Bathroom's entrance to the Rooftop Pool. 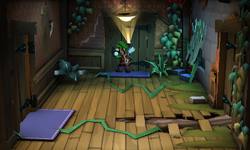 The door to the West Bathroom is locked, however, but Luigi can investigate a hole in this room to view the Crow's Nest and see a portrait of a key on the fifth floor that can be accessed by going through the Conservatory. In B-5: Doggone Key, Luigi needs to fight three Creepers in this room before he can catch the Polterpup in the West Bedroom. This page was last edited on May 1, 2017, at 21:13.